Original hand carved by Karl Deen Sanders for MacFarlane Toys. 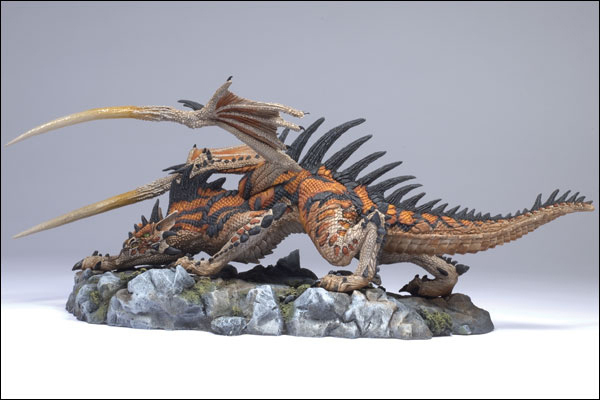 About the Series: Delve into the Fall of the Dragon Kingdom with McFarlane’s Hunter Dragon Clan Statue; a richly detailed 6-inch scale dragon action figures complete with detailed bases showcasing the mystery and fury of the mythical winged kingdom. Crawling Hunter dragon measures 11 inches from horn to tail. McFarlane’s Hunter Dragon Clan Statue on custom rock base measures 4 ½ inches at highest point. Articulated at neck, shoulders, and at hips. From McFarlane Toys: Horror is a cornerstone of McFarlane Toys. It’s simple. They just love to create scary monster action figures – and their fans like them, too. The edgier, the more horrific, the better. This Hunter Dragon figure is sure to be a terror-ific addition to any monster collection. Figure measures 7″ tall.